It's more than just a fun visual. The atlas reveals a whole new way of organizing the cerebral cortex—the .08-ish-inch-thick sheet of neural tissue that wraps around the brain. This thin envelope contains multiple layers of interconnected neurons with key roles in memory, attention, language, cognition, and consciousness. Other brain maps organize the brain by differences in tissues and their function. This genetics-based depiction organizes brain activity in a new way, and it could help scientists study age-related changes in brain structure, as well as diseases and disorders associated with cognitive function. 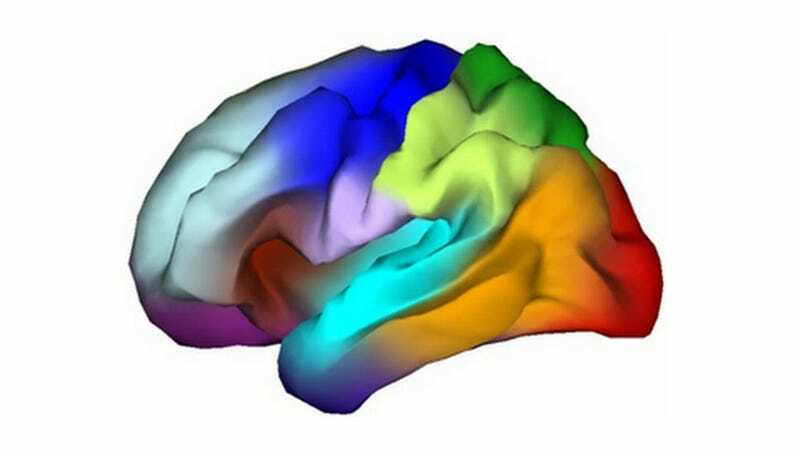 To make the new map, the team of scientists used magnetic resonance imaging to look at the brains of 406 adult twins who were already part of the Vietnam Era Twin Registry, an ongoing study of cognitive aging. Identical twins share 100 percent of their genes and fraternal twins share 50 percent. So by comparing MRIs from sets of twins, the scientists could compare aspects of their cortical structure. They believe the same genes tend to determine the size of each portion (the colored sections), and that different genes determine the size of other portions. The next step? Researchers will try to figure out which genetic traits are associated with which regions of the cerebral cortex. William Kremen, psychiatry professor at the University of California in San Diego and a lead author in the study, will help develop the gene association studies. The studies will look at single nucleotide polymorphisms (SNPs), or small genetic code variations between individuals. "We'll see how the size of the different regions may be related to cognitive function and other behavioral measures," Kremen wrote in an email.